We are just completing the fourth Alpha Course of 2018/19 and the blessing of God in this ministry has been incredibly humbling. On this most recent course we have four people interested in baptism, two others articulating a Christian faith for the first time, others asking for their first Bible and yet others wanting to journey further in their exploration – praise God! Another evangelistic ministry in the church called ‘Sent’ has recently adopted the ‘Treasure Hunting’ tool for evangelism. This is essentially taking time to listen to God for ‘clues’ before going out on the streets of Canterbury during our morning service to meet people and bring something of Christ to them. Treasure Hunting has honed our hour on the streets to have more fruitful and powerful encounters. It is improving our ability to hear from God and rely more on His leading. We have seen increased teamwork as we compare, link and decipher our clues together. It is also hugely enjoyable to partner with God in this way. ‘Waterfall’ and ‘Sainsbury’s’ led us to a male couple who were very ready and open to discuss Christianity. ‘Wetherspoons’, ‘pain’, ‘arthritis’ and ‘knee’ led us to a female Christian. We prayed for physical healing and she noticed a big, immediate improvement. 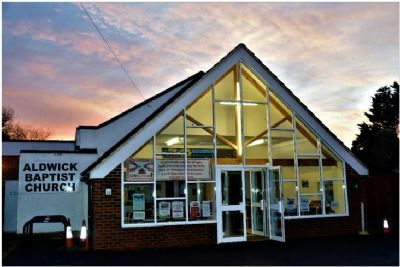 ‘Train station’, ‘young man’ and ‘black clothes’ led to a 20-year-old clubber who was ready for a conversation about faith and accepted prayer. ‘WHSmith’, ‘dog’, ‘wheelchair’ and ‘loneliness’ led to an elderly Christian lady who dissolved into tears when she had realised God knew her situation. Please pray for the funding applications being made to launch our new café partnership. For resulting fruit of both evangelistic ministries above. And our smooth transition to CIO, due to be completed in April this year. 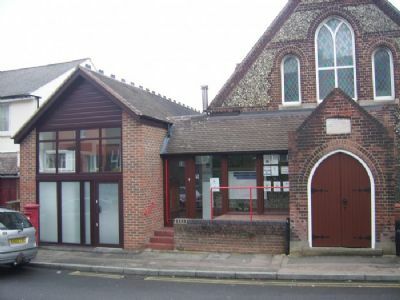 Please pray for the Fellowship at Wellington Square Baptist Church, Hastings, as they seek God's plans for the future. In 1874 Charles Spurgeon opened the first Baptist Church in Merstham. 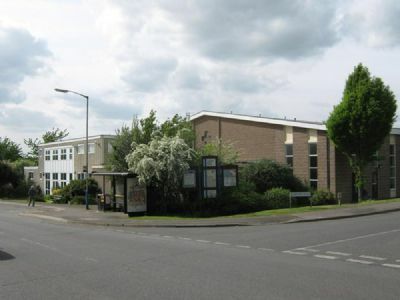 By 1959 a new church was built on our present site in Weldon Way. Sadly like the large estate, our church building became very run down and was demolished several years ago. Since then for all the church activities home has been a porta cabin. With the help of SEBA we have been able to add a second cabin which has helped enable us to start an after schools club which now attracts 20+ children most weeks. One little boy with challenging issues recently made us a little cross stuck together with sticky tape. Our prayer and out outreach is focused on him and many like him to find peace and purpose in Jesus, the one who died on the cross to give them real life and hope. The exciting news from Merstham is now we are quite well advanced in securing a new church centre with Medcentres (Specialist Developers). We are hoping to bring plans for approval in the next few months. Other exciting developments are that for almost a year we as a church have been ‘litter picking and prayer walking’. This along with our investment with the local Food Bank means MBC is now developing a much wider profile in our community. With our last ‘litter pick’ we have now partnered with the community hub. This also has the benefit of free coffee and cake afterwards at our community café! At Easter Malcolm will have been pastor at Downs Baptist Church, Woodingdean longer than any other church he has pastored. The church continues to grow in their love of the Lord and is working hard at sharing that love. We recently enjoyed the process of putting together a vision and purpose statement, placing emphasis on the process of putting it together rather than getting to this point where we can have it stuck to the fridge and posted on the church website. Also in the news is that the year ahead is pretty much planned to be like the last one. This is not because we are stuck in a rut or in love with our traditions but after continually assessing, all that we do and who we are, we believe it is right to continue in this way. Therefore we put a lot of emphasis on our church shop, we will take part in the community carnival, have a service down on the beach, offer a free bouncy castle and BBQ one sunny (possibly sunny) Sunday and a whole host more. We are doing well and are going to keep on doing well. In all our plans for activities may we be the kind of people God wants us to be. Keeping in step with the Spirit for our church programme and our own personal walk with him. May the fruit of the Spirit have a bountiful crop. For those who are struggling amongst our church family. As bodies age and operations are required we pray that the way we face these challenges will speak volumes of the One who puts peace into our lives in our trying circumstances. Particular prayers for a new Christian who still has to work through the consequences of their past. Amongst our practical needs as a small church we struggle financially. Pray that we can continue to trust God to provide for our needs and we ask for our daily bread. What is the Tool Shed? The Tool Shed is really what it says on the tin; a place you can go to get the right tool for the job . . . except ‘the job’ isn’t putting up a shelf or mowing the lawn but instead faith-life activities like how to go about sharing your faith, training in how to lead a small group or getting to grips with the basics of the Bible. Why are we doing this in Bookham? Really because we realised that while we have our congregational setting where we worship and hear the word preached, and our small group setting where we build relationships, practice gifts and learn to love, there was a ‘discipleship’ or ‘equipping’ gap. We needed to provide opportunities for slightly more formal learning or practical trying out of new skills that there is rarely time or expertise for in our small group setting. How do we do it? So as not to compete with our small groups which run on Tuesdays, Wednesdays and Thursdays we run our courses centrally in our building on Monday evenings. The priorities for the Tool Shed are agreed by our leadership team and then a ‘champion’ is appointed for each course. The champion, helped by our admin team, advertises, prepares for and runs their course. The courses vary from 2 to 8 weeks and are free of charge except for materials. Examples of courses we’ve run are a membership course, small group leader training, a pastoral care course, Creative Writing for a Spirit-filled Life, Equipping for Discipling. Do pray that folks will be encouraged and equipped in their faith through the Tool Shed and that we will use our resources with wisdom and not become over-stretched. This was the name we chose for a day conference held at Bookham Baptist Church under the auspices of Churches Together in Bookham on March 6th. We wanted to inspire people with the challenge of working with the growing numbers of elderly in our community, especially those who are in living in care homes, or housebound, and experiencing increasing frailty of body and mind. Our speaker was Debbie Thrower, who was the first Anna Chaplain in Alton, Hampshire from 2010. She now works for BRF “The Gift of Years” (www.brf.org.uk/thegiftofyears) supporting and developing a national network of Anna Chaplains, of which there are now upwards of 60. She first helped us to understand some of the spiritual issues associated with ageing and then shared storied of how Anna Chaplains work in the community offering spiritual care to people with dementia and their carers. After lunch there were workshops on knowing the needs of your patch, using creative approaches with older people and the story of a local initiative set up to support those living with dementia and their carers. 90 people attended from as far afield as Edenbridge to the east and Guildford to the west. Feedback included words such as “inspirational”, “informative”, “eye-opening”. More importantly a vision has been seeded amongst us and we are seeking how to move forward to employ our own Anna Chaplain. Please pray for God’s guidance as we seek to the next steps. As a church we have just finished a week of prayer as we seek God’s will for all we do, but also give thanks for all He is already doing in the fellowship and in the community around us. Our mid-week activities, coffee morning and monthly craft group, have been growing recently, which is great. 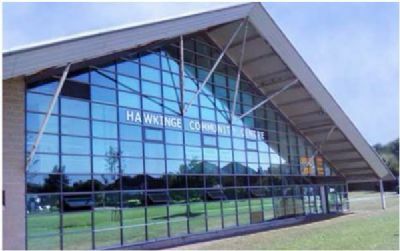 This allows greater contact with members of the Hawkinge Community and the opportunity to build relationships. We have an exciting opportunity coming up as we welcome students from an American Bible College to join us for a weekend of mission at the end of May. Please pray for the planning of the weekend in May that it would be a great opportunity for the students and we use their gifts and skills wisely to reach out into the community. For our Easter services, our Easter craft morning for families, and outreach material being shared with friends and family. That conversations might start, and lives changed. For those in our congregation who are struggling with long term ill health at this time. We are having a Film Week this Easter week. We have children’s and youth weekend away (12-14.4.19.) at Letton Hall. Our Alpha Course has gone well and almost everyone wants to continue with a Bible course. Please pray that people embrace Jesus. We will run Sunday Funday on 14.7.19. which is a church townwide event in partnership with Tonbridge Angels Football Club. Our Outreach Minister, Sally Allen, heads it up. Over 5,800 people came 2 years ago. Please pray that it is an enjoyable day and Jesus is clearly and creatively communicated. Please pray for our continued work in and with our local community around food poverty. The church membership and its physical wellbeing and spiritual growth. The development of the Leadership team, church prayer life and house groups as we move forward in step with the Lord.